Adding performance trace minerals to your dairy cattle nutrition program is an important step in boosting animal performance and productivity, but equally important is making sure the trace minerals and other concentrate feed components are consistently being mixed into the feed ration. 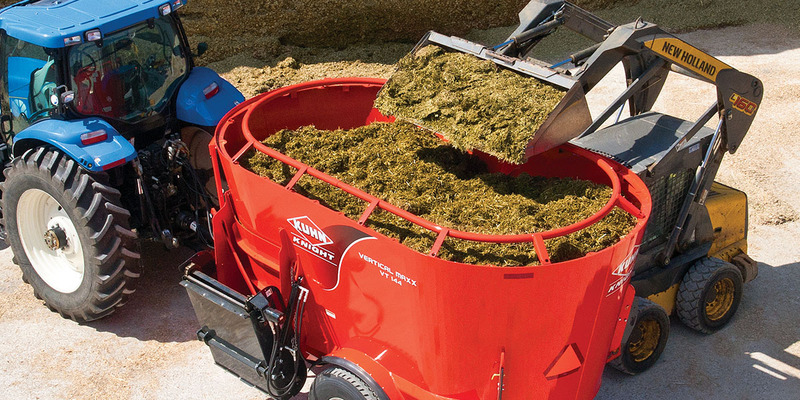 Most large, modern dairy operations are blending feed components with vertical or horizontal mixer wagons, with vertical mixer wagons being the most popular, especially for those dairy operations that are feeding dry hay that needs to be processed. Presenting feed to the cattle as a total mixed ration (TMR) allows for accurate blending of the ration feed components to match what your nutritionist has formulated. If you’re not getting a consistent mix of the feed, you will see sorting in the feed bunk. This can lead to the cattle consuming less fiber and more concentrate than expected, lowering the rumen pH and, ultimately, having a negative impact on herd health and productivity. Furthermore, the impact of adding Zinpro Performance Minerals® may be affected as all animals may not be getting adequate levels of these trace nutrients due to inconsistent mixing. So, it’s important to make sure your mixer wagon is in top condition to ensure accurate blending of your feed components to deliver the best ration possible. One of the biggest factors in getting a consistent feed mix from your mixer wagon is performing regular maintenance and ensuring proper mixer wagon setup based on the operator’s manual. Also, it’s important to mix on a level surface and keep the mixer wagon running while you add your feed components. While it’s important not to overload the mixer wagon, smaller loads require special attention as well. When mixing a smaller load of feed, be sure not to pour your ingredients on top of the augers since, in a small load, the ingredients can stick on top of the augers and not be thoroughly mixed into the ration. The best method when mixing a small load is to add feed components down the sidewall of the mixer wagon. There are several visual signs that you are not getting the right mix inside the wagon, such as seeing dead spots, which happen when there is feed that is not moving and, a lot of times, it happens around the discharge door. Understand how your current ration is mixing. Setting the baffles too deep can cause dead spots. Additionally, in a twin-screw mixer wagon, if the front of the mixer wagon is filling up higher than the back tub, that means the front screw is not moving feed to the back. That may indicate the need to inspect and replace the knives or kicker plates. The feed should stay fairly-level and consistent from the front to the back, even when you’re unloading. If you’re unloading at the feed bunk and notice that it’s taking longer to discharge the feed, or the feed in the feed bunk looks wavy, this indicates that either a kicker plate may need to be replaced or the augers aren’t keeping up with each other to push the feed out in a uniform manner. If you’re seeing unmixed or inconsistent mix, check the condition of the knives as well as placement and how many knives are on each auger. Make sure to check the condition of the kicker plates and track the wear. If they get worn down too much it will affect the consistency of the TMR. These are mixing wagon components that can be easily replaced or adjusted to help ensure a consistent mix. It is also important to add your feed components to the mixer wagon in the correct order. First, add feed components that will require particle size reduction, such as dry hay, dry alfalfa, corn stalks, etc., to break down the forage length. Second, add the premix and small inclusion-made components to the mixer wagon. If the trace minerals, your small inclusion ingredients, are not in the premix, they should be added at this time. It’s important to add premix and trace minerals down the inside wall of a vertical mixer wagon to make sure the trace mineral or premix doesn’t stick to the top of the screws. This is also a good time to add molasses to the mixing wagon to give additional time to consistently mix with the other feed components, since it is a difficult ingredient to mix. Third, add any silage that will make up the final part of the mix order, followed by liquids, including whey and water. If TMR includes high moisture baleage, place this forage in the mixer first. Allow time for bales to break apart and level out in the mixer before adding other feed components. It’s important to catch problems before they effect the cows. It’s very difficult to troubleshoot a ration change if the mixer wagon isn’t fully maintained. To learn more about mixer wagon best practices and adding performance trace minerals to your dairy cattle nutrition program, contact a Zinpro representative today.